For consumers who might have slept through their alarm and missed out on the Black Friday sales, or for unlucky individuals who may have gotten sideswiped by a determined housewife and missed the last doorbuster deal, there is hope on the horizon. Cyber Monday is approaching, and with it a massive new set of deals and savings available only online to those shoppers savvy enough to brave the cyber world and navigate their way to fabulous savings. Among a host of other retailers, the Lenovo Cyber Monday specials will be announced tomorrow online at CouponBuzz.com. ...the fact that we’re all back at work doesn’t seem to put a dent in our Cyber Monday shopping. For consumers who might have slept through their alarm and missed out on the Black Friday sales, or for unlucky individuals who may have gotten sideswiped by a determined housewife and missed the last doorbuster deal, there is hope on the horizon. Cyber Monday is approaching, and with it a massive new set of deals and savings available only online to those shoppers savvy enough to brave the cyber world and navigate their way to fabulous savings. Among a host of other retailers, the Lenovo Cyber Monday specials will be announced tomorrow online at CouponBuzz.com. An online coupon website, CouponBuzz.com has launched a unique new Cyber Monday coupon section, specifically designed to help online shoppers organize their Cyber Monday shopping as efficiently as possible. In fact, according to an article reported by ComScore.com in 2009, “On Cyber Monday this year, more than half of dollars spent online at U.S. Web sites originated from work computers (52.7 percent).” That is some impressive multi-tasking. Given that so much of Cyber Monday shopping seems to be done on the job, CouponBuzz.com is ready to help consumers make the most efficient use of their stolen minutes. They have aggregated all the Cyber Monday deals, including the Lenovo Cyber Monday coupons, in one convenient location. 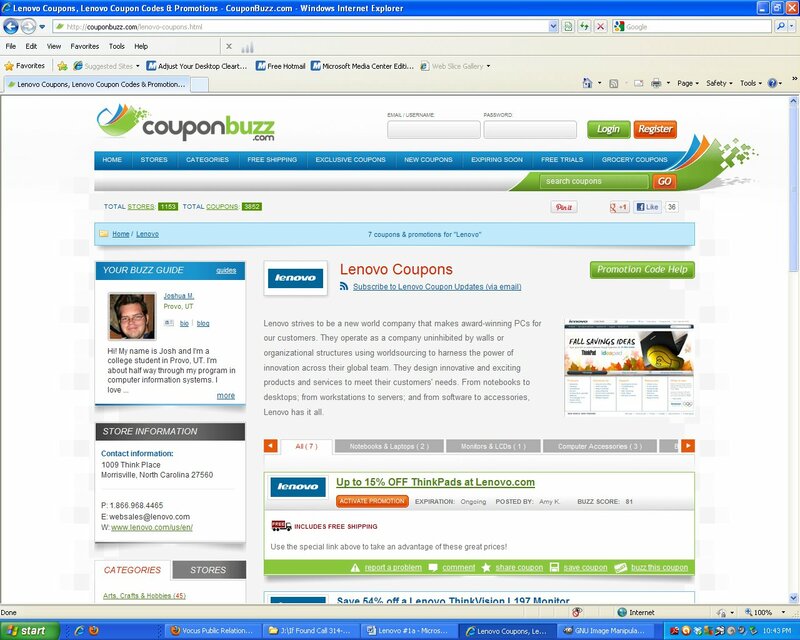 Online shoppers interested utilizing this convenient tool should definitely make the time to visit CouponBuzz.com. In addition to the Lenovo offers, their Cyber Monday webpage includes coupon codes from other popular retailers like Sony, HP, MacMall.com and Best Buy. Accessing the coupons and deals compiled on this page is as simple as clicking on the following link http://couponbuzz.com/seasonal/cyber-monday.